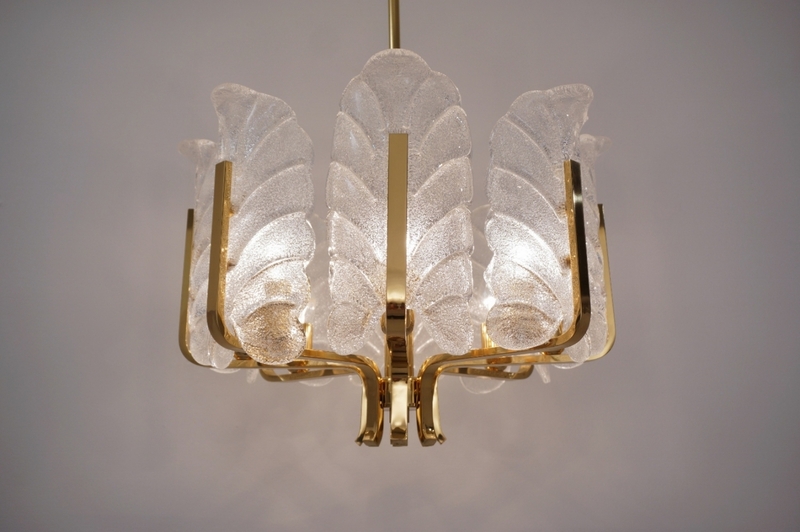 Carl Fagerlund Orrefors chandelier glass leaves & brass, 8 light, 1960`s ca, Sweden.Thoroughly cleaned respecting the antique patina, newly rewired & earthed, in full working order and ready to install. Light bulbs included. It is possible to install this light in other countries although it may be necessary to purchase different light bulbs suitable to local electricity. It can be used with a dimmer. 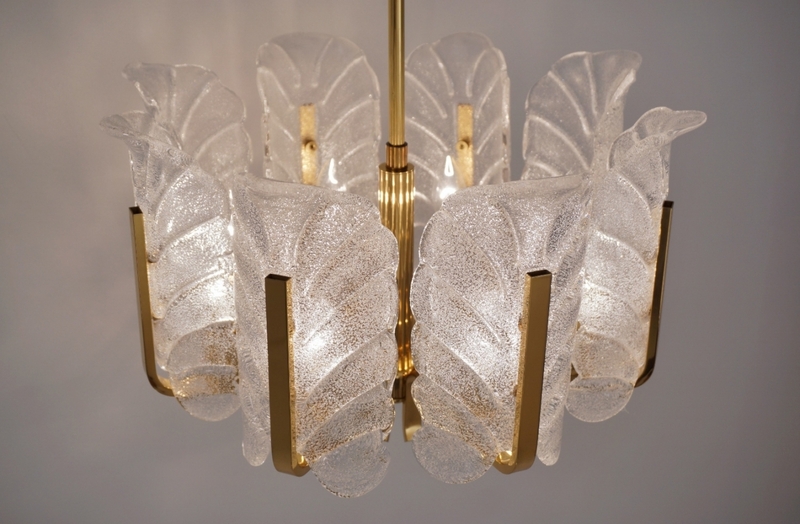 This sculptural vintage chandelier, attributed to Carl Fagerlund for Orrefors Lighting, is an elegant composition in quality brass with 8 large glass leaves. 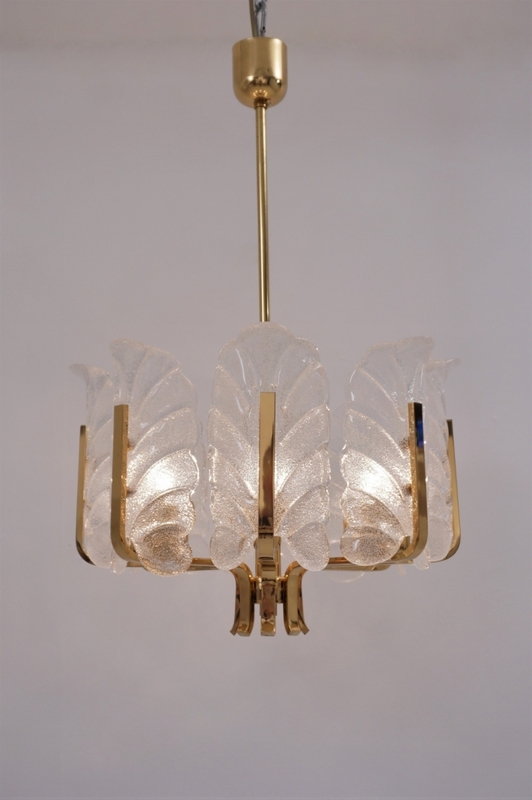 The combination of Modernism & floral makes this chandelier a unique addition to a range of interiors such as Art Deco, Mid-Century Modern, Hollywood Regency, 70`s Glamour, Traditional or Contemporary. 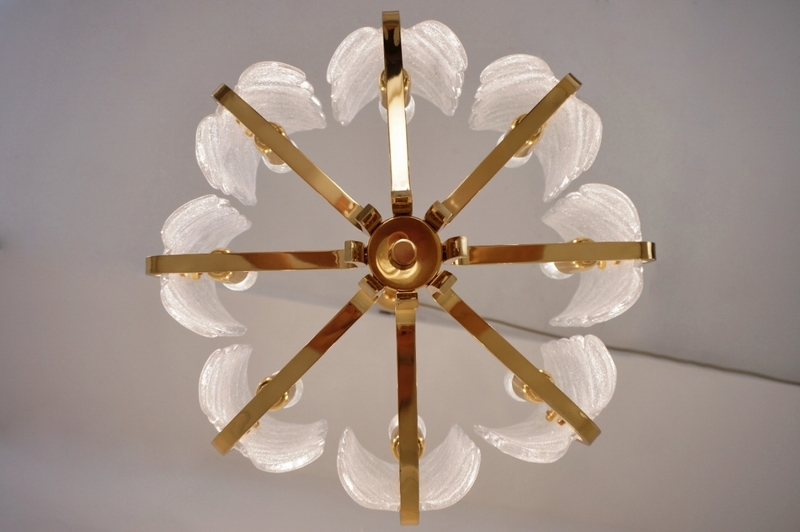 The solid brass frame in a sunburst shape has 8 arms of rectangular section, each of which curves upwards to complete the leaf design. 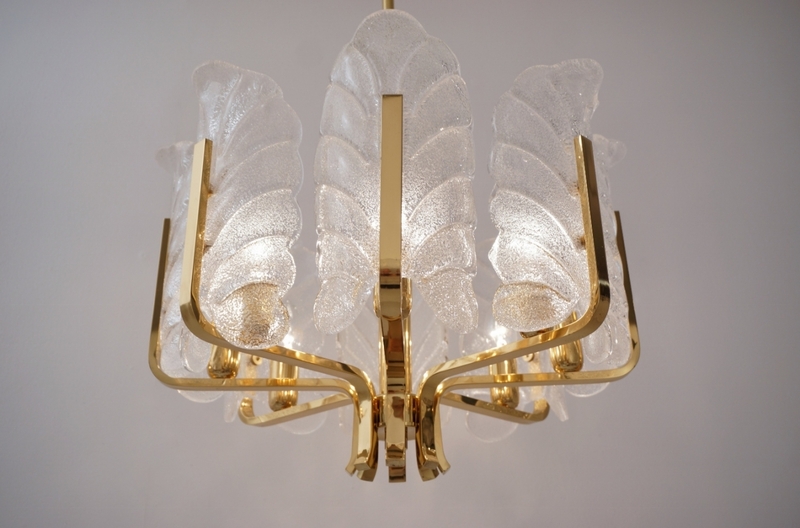 The removable glass shades attach by two decorative solid brass screws internally to the arm. The frame is finished at the bottom with a decorative Neoclassical solid brass finial. The 8 lamp holders sit on the arms facing upwards and have decorative cylinder shape solid brass tube covers. 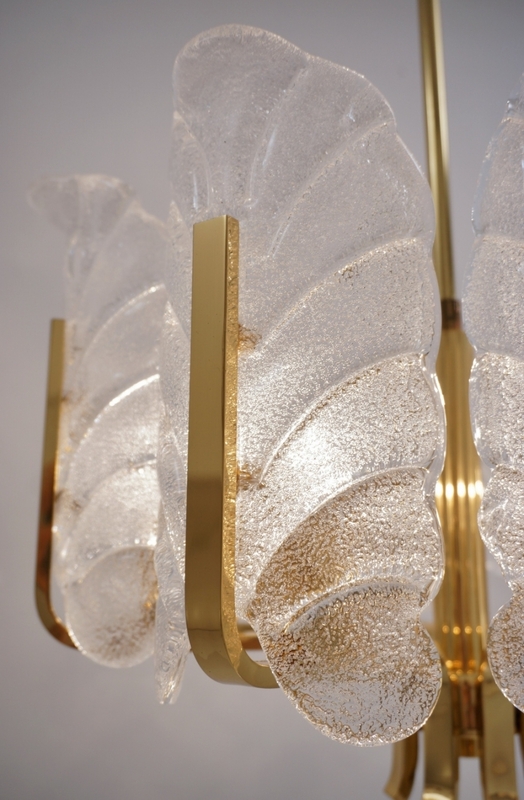 Each sculptural clear glass shade is shaped with a texture pattern as a leaf, and has a curved base which rests inset on the brass arm giving this piece depth & volume. The 8 clear glass shades have an external gloss finish and internally there is a layer of sparkling specks of crystal shards creating depth and great reflections. 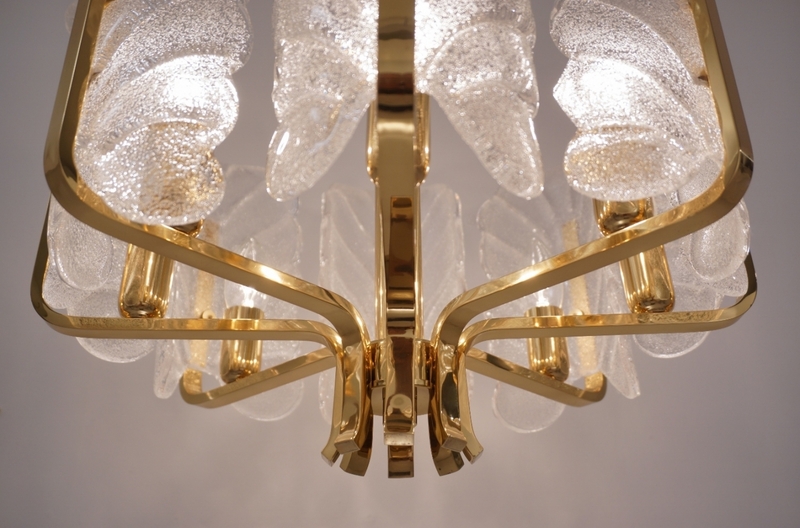 The 8 lamp holders have solid polished brass covers. This chandelier carries 8 E 14 small standard screw lightbulbs up to 60 Watts each. Presently fitted & photographed with 25 Watts Candle clear light bulbs which are included in this price. The solid brass hanging rod unscrews from the top of the frame, and can be changed, lengthened, shortened or replaced with a chain if needed. 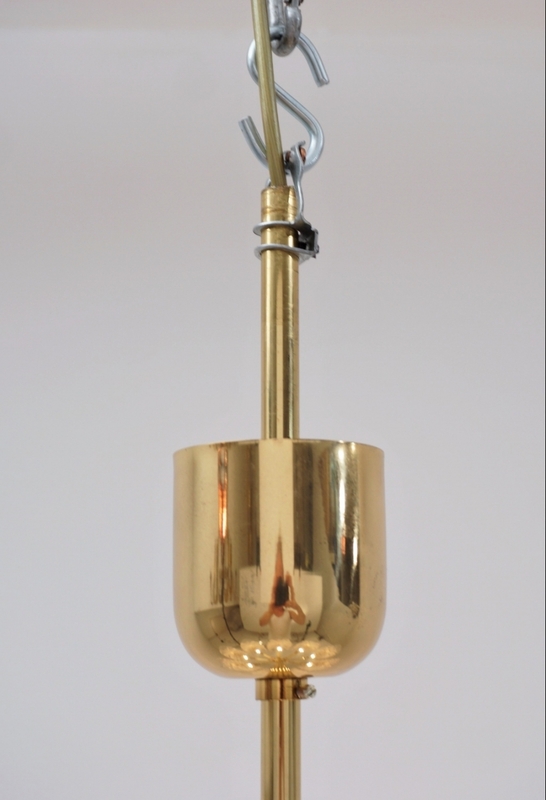 At the top of the rod there is an S hook to fit the piece to the ceiling, together with a removable decorative solid brass ceiling cup to cover this hook. 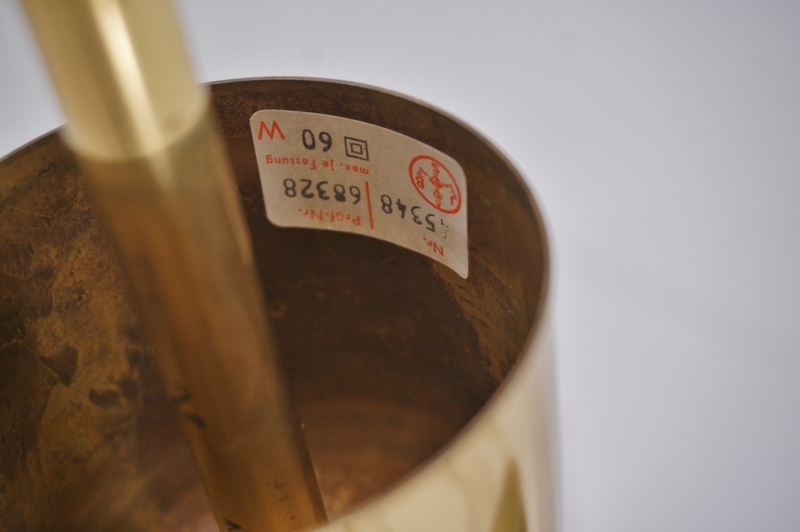 The original maker`s paper label is still present inside the ceiling cup. 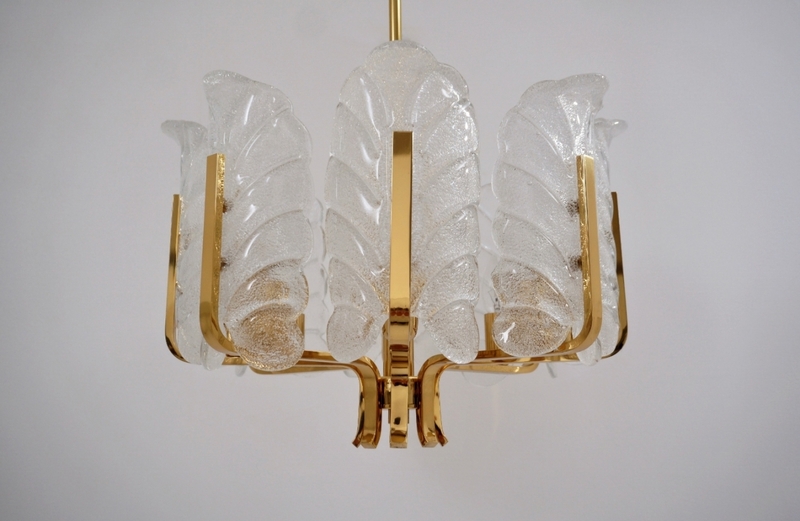 This vintage chandelier is in very good condition. 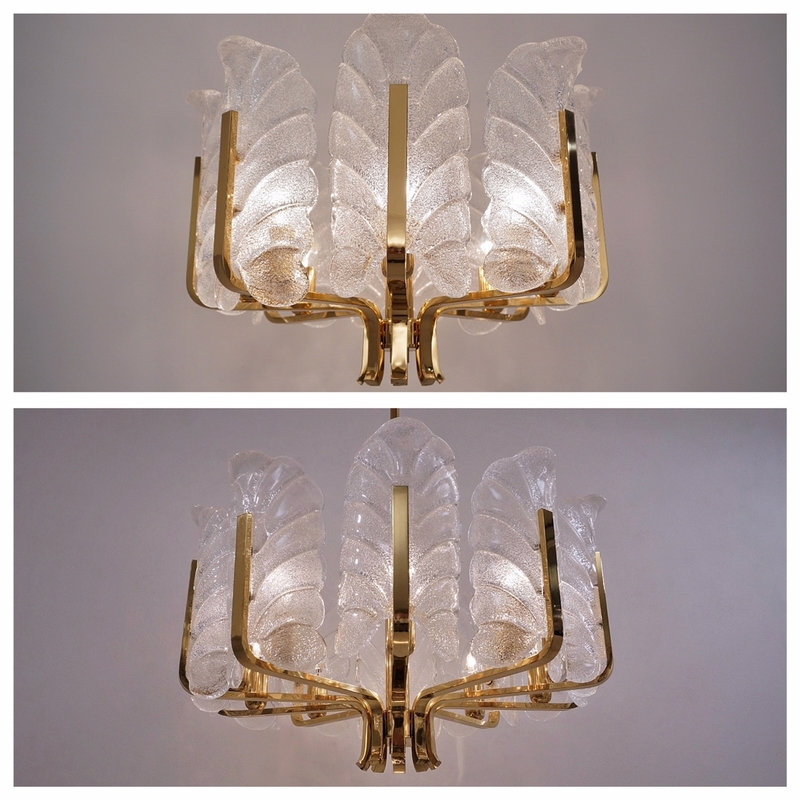 The polished brass finish on the frame is the original, the original clear lacquer is present and has a very attractive warm patina adding character. The 8 glass leaves are all in very good condition with no chips or internal cracks. Packing is offered free of charge. We take special professional care while packing. For safe transport, all the glass pieces will be removed and individually bubble wrapped. 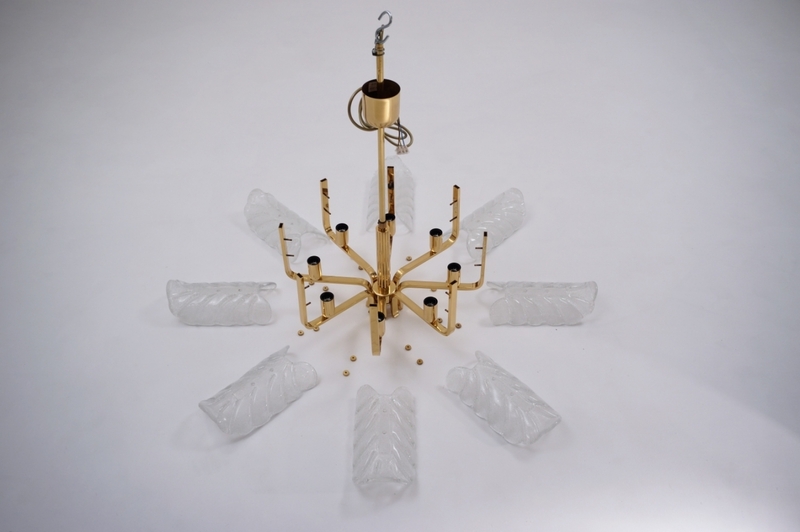 If necessary the pendant bar can be unscrewed from the frame so this chandelier easily fits within a box for shipping. 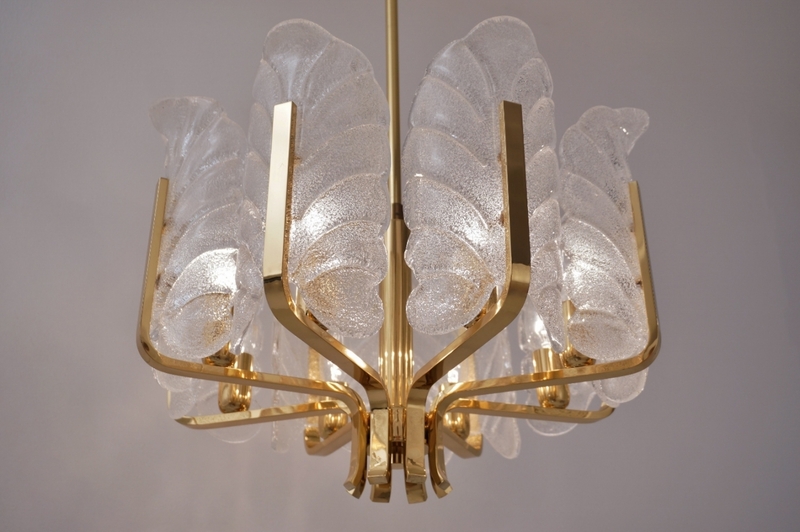 Additional dimensions: Total Height of the chandelier with the rod is 72 cm. Height of only the frame with glass shades but without the rod is 32 cm. Total Diameter with glass shades is 47 cm. 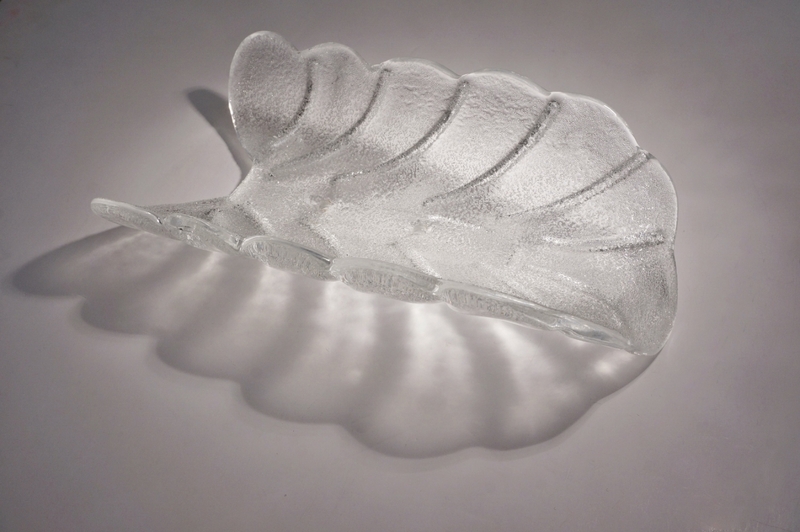 Each glass leaf has a Height of 24 cm and Width of 13 cm. 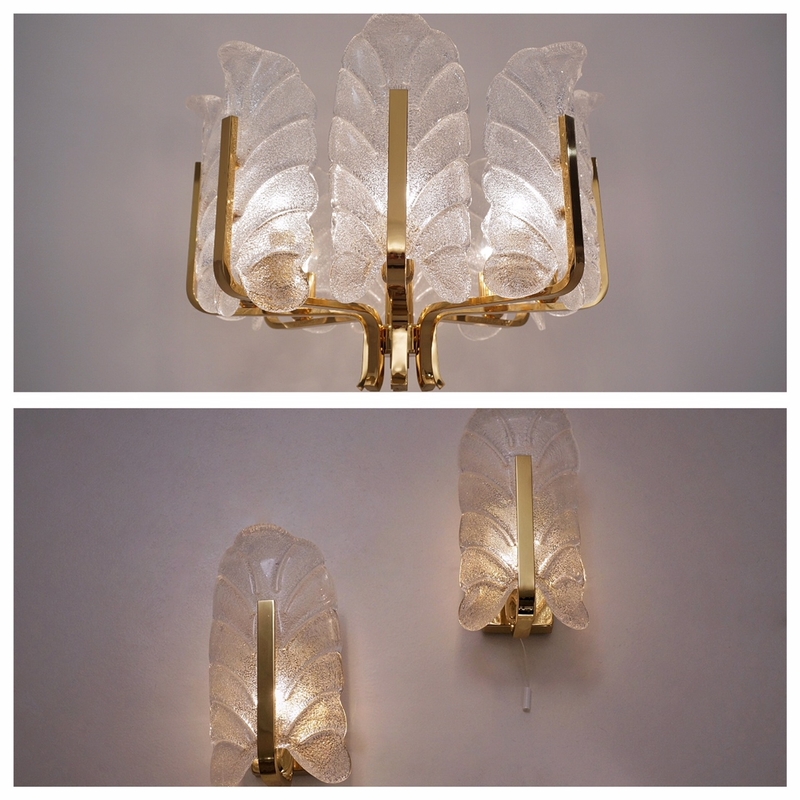 We have also available for sale in stock a large matching chandelier with 10 lights, please see item # 11031, and a pair of matching sconces, item # 11056.ORREFORS LIGHTING HISTORYOrrefors Glasbruk was founded in Orrefors, Sweden in 1898. Read more on our Roomscape Blog about Carl Fagerlund Orrefors Lighting.